10-Feb-2002 -- This story continues from 23°N 115°E. SATURDAY 9 FEBRUARY 2002. I took a bus back to Huidong from Duozhu, then got a lift from Huidong down to the main freeway that runs along the coast. I waited at the freeway entrance for what seemed like a very long time before a bus eventually came by that was going my way and was willing to pick me up. I was on my way again at 12:30 p.m., on a slow old bus that stopped frequently. Nevertheless, by 3 p.m. I was able to disembark at a point just seven kilometres from the confluence, then take a motorbike to the village of Kuifeng, only three kilometres from the confluence. I left my heavy backpack at the local store, and set off with two locals, first by motorbike, and then on foot, in search of the confluence. We traversed many hills through low scrub, but were still one kilometre away when it became obvious that we weren't going to have sufficient time to reach the confluence and make it back before nightfall, so we called it a day and turned back for Kuifeng. From a vantage point atop one of the many hills, I was however able to discern that there was possibly an easier approach from the south, which was much flatter, and had a promising track going in roughly the right direction. I decided to spend the night in the nearest sizeable town, Donggang, and the same two locals gave me a lift there. It turned out that there was only one guesthouse in the whole of Donggang, and the owner wasn't willing to accept a foreigner unless sanctioned by the local constabulary, so I went to the local police station and dutifully registered my presence. The guesthouse owner, suitably appeased, became very welcoming, as did his whole family. His son, Li Chongxin, took me to a local restaurant for dinner, where I told him of my plans for the following day, and showed him the excellent topological map of the area that my colleague Winson Lai had printed for me prior to my departure. 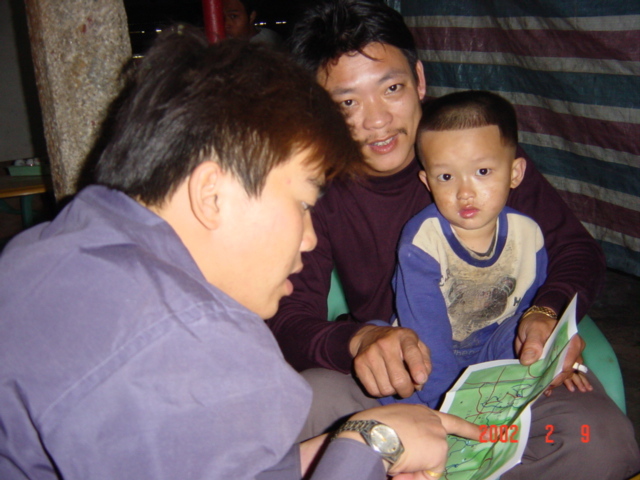 Chongxin (on the left in picture #3) discussed the map with his friend, and between them they came up with a consensus on how best to tackle the confluence. After dinner, Chongxin took me for a quick tour of Donggang (there wasn't much to it), and then I paid a visit to the hairdresser next door to the guesthouse. The hairdresser proved to be Donggang's redeeming feature; for US$2, not only did I get my hair washed and blow-dried, but also received a full hour of extremely pleasant and relaxing massage to my scalp, my neck, my shoulders, my arms, and my back, right down to my waist. It was the perfect medicine for my tired and aching body, which had endured two heavy bouts of climbing during the day, at 23°N 115°E in the morning, and then the unsuccessful attempt at 23°N 116°E in the afternoon. SUNDAY 10 FEBRUARY 2002. At first light the next morning, Chongxin and I set off on his motorbike towards the confluence. We found the track I'd seen the day before, which made its way north past a dam, then up a valley towards the confluence. With about 600 metres to go, we left the bike and scrambled up a hill, only to discover that the track we'd been on wound its way around the hill and continued on in the direction of the confluence. 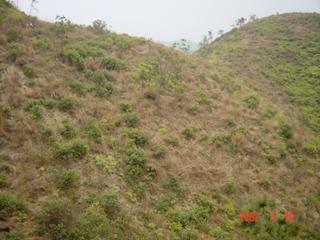 Picture #2 was taken from this hilltop. It was a very hazy day, as it often is in this part of China, sad to say. 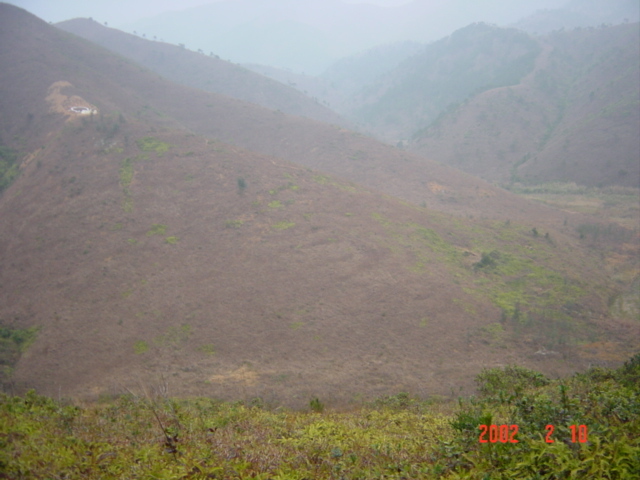 A typical Chinese hillside grave is visible in the top left of the photo. The Chinese like to bury their dearly departed somewhere where they can enjoy a nice view. So back down the hill we went, and rode down to about 100 metres from the confluence. But there was a stream between us and the hill we needed to climb, and no way across. We went back and followed another track that got us to within 200 metres of the confluence on the other side of the hill, but we faced the same problem with a different stream. Finally, we decided the only way was to go back to the dwelling we'd passed more than 300 metres away from the confluence, where there was relatively easy access to the hills, then follow the crests of the hills along to the spot. 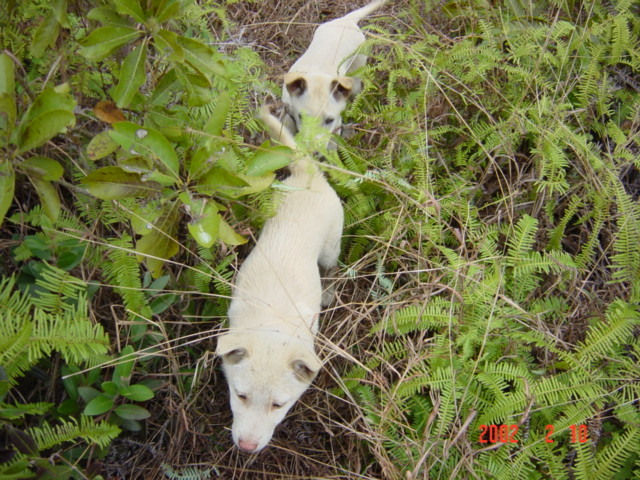 There was nobody home at the dwelling except for two very friendly puppies (picture #8), who accompanied us the whole way to the confluence, which proved readily accessible by this means of approach. We reached it at 9 a.m.
Having accomplished our goal, we rode back to the guesthouse to collect my backpack, then Chongxin took me on his motorbike all the way to Kuitan, from where I was able to catch a bus to begin the next leg of my journey towards 24°N 117°E. #7: Spot on this time!